With whale watching cruises more popular than ever, Captain Cook Cruises is again operating its daily Whale Watching cruises throughout the Whale Watching season of May 27th to November 15th, 2008. 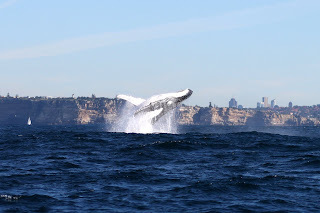 The Whale Watching cruise takes passengers past the Sydney Opera House, Fort Denison and all the beautiful homes located in the bays of Sydney Harbour and then out through the heads and onto the open waters. Here the direction of the vessel is totally dependent on where the whales have been sighted – north towards Manly or south towards Coogee. Most whales are found within 2kms of shore. The number of Humpback and Southern Wright whales passing through Sydney on the annual northern migration between Antarctica and their winter feeding grounds as far north the Great Barrier Reef, is expected to reach its traditional peak around the Winter Solstice on June 22nd. After calving in the northern waters between August and September, the whales will then again head south through Sydney, making their long journey back to Antarctica. All Whale Watching cruises are held on a 75-passenger, 16 metre super sea-catamaran purpose built for Whale Watching and featuring two decks both offering spectacular open air viewing and a comfortable all-weather lounge for the entire family. Captain Cook Cruises offers a whale guarantee - if a whale is not sighted in the months of May to November 2008 passengers can rebook another cruise free of charge or for those cruising in June and July they also have the choice to receive 50% of their money back. Whale Watching cruises depart daily from Circular Quay at 1.30pm and twice daily from Darling Harbour at 9.00am and 1.15pm from May 27th to November 15th, 2008. Whale Watching Cruises are priced at: adults $69, concession $59, child (4-14yrs) $39, family (2ad+2ch) $179 and additional child same family $30. For further information and bookings, please contact Captain Cook Cruises on Tel: 02 9206-1111 or visit www.captaincook.com.au.